Welcome to Cabin Run Creek Campground! The campground features 32 campsites nestled within woodland. You can bring your tent, RV, travel trailer, fifth wheel or popup camper and if you have an ATV or golf cart your welcome to bring it. We have 25 campsites with water and electric hookup, has 30 amp service on most sites, six sites have 50 amp service. There are 5 campsites with full hookup, (water, 20 and 30 or 50 amp electric and sewer) and have frost free water spigots for all year camping. We also have primitive sites in the back close to the water & electric sites and are close to the shower house or if you want to be farther away, you can camp primitive on the hillside. We have a nice bathhouse with showers and restrooms that is handicap accessible and one dump station, picnic tables and fire pits. There is a playground, a basketball net and some trails on the hillside. If it's fishing you want, the Ohio River is only 5 minutes down State Rt. 1159 on Rt. 8. Check out the Pay and Reserve button on the menu, we accept Credit Cards through PayPal. (See about us for pictures of campground and activities for current events). We are on St. Rt. 9, AA Highway, 1/4 mile North of St. Rt. 1159 in Bracken County, KY.
Alt. # (859) 838-6400 if no answer leave a message. Veterans and Military customers and seniors 65 years + get $3 off on a daily campsite rental. 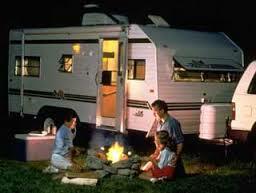 Group rate-Rent 5 or more campsites get 10% off on one night campsite rental. Discounts only apply to the water and electric campsites 1-8, 17-20 and 23-27. DISCOUNTS ARE NOT VALID ON FULL HOOKUP AND PRIMITIVE CAMPSITES. Discounts are void on major holidays. Campsites #9 through #15 have sewer hookup now. That means those campsites have full hookup which includes water, electric and sewer. These sites have no electric meter so the electric is included in the price. Camp will open on April 26 and close on Oct. 27th for the 2019 season. Changes may apply per weather. New for 2019, we added a kids dome climber and a big spinner to our playground.